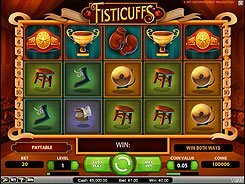 Fisticuffs is a boxing-themed video slot based on the Win Both Ways system whereby payouts are awarded on any winning combo created from left to right AND right to left. 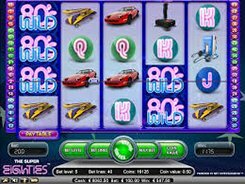 The slot features 5 reels and 10 fixed paylines. 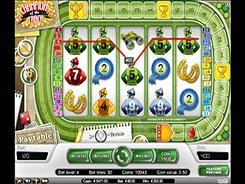 Before any spin you can configure a coin value ($0.01 to $1) and the number of coins per bet line (1 to 10). As the slot uses the Win Both Ways feature, the bet amount gets doubled, thus the floor and ceiling stakes are $0.2 and 200 respectively. 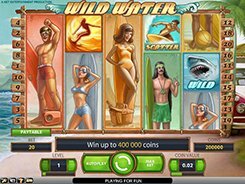 There are four types of wild symbols in the slot: a normal wild, stacked wild, straight wild, and diagonal wild. A normal wild appears during a base game and substitutes for all regular symbols, while a stacked wild can only occur during the Boxing feature. The latter is triggered whenever a straight wild (Big Boxer) and a diagonal wild (Skinny Boxer) land on adjacent reels. If this happens, one of the boxers will punch the other causing the attacked boxer to move to reel 1 or 5. Then, all the symbols between the two boxers will morph into wilds which can bring you a decent cash award. The best jackpot prize in Fisticuffs is $5000, this is awarded for hitting five Championship Belt symbols across a bet line.